When Jenny at Silver Screen Suppers asked for test cooks for her Columbo Cookbook, Zelda was happy to volunteer and picked some vegetarian recipes which had been suggested by some of the guest stars in the numerous episodes. 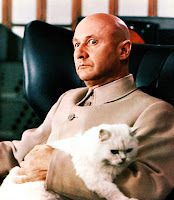 Then she saw Donald Pleasence’s No-name Curry which was actually fish-based, but easily lends itself to a vegetarian makeover, as it is the sauce itself which is the important part of the dish, and fancied making a veggie version of it. The original recipe can be found here. As the psychiatrist in Halloween, the prisoner of war who becomes almost blind in The Great Escape and Bond villain Blofeld in You Only Live Twice (among many other roles), Donald Pleasence certainly made his screen presence known. 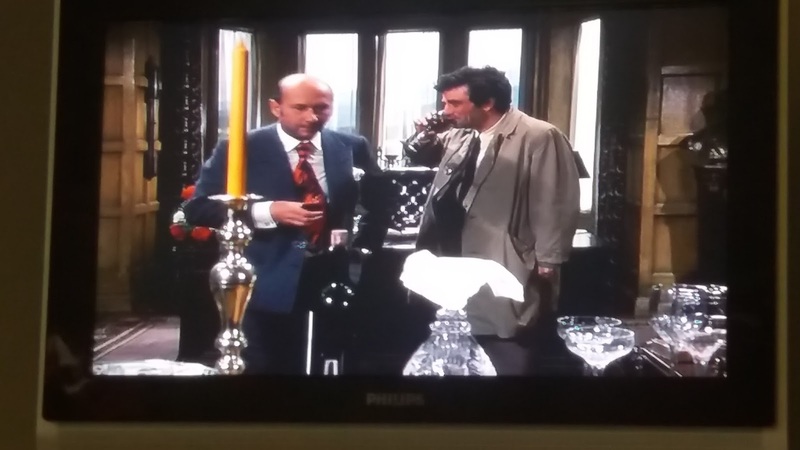 In the 1973 Columbo episode Any Old Port in a Storm, he plays a vintner who will kill to protect his interests. Just like Johnny Cash’s Chilli, this was not originally a vegetarian recipe but with a few tweaks it can easily become one. I have used the usual names for the herbs and spices so that sourcing is easier. I would have had no difficulty finding these in the local supermarket (although most were already in my ‘storecupboard’). I find it easy to measure in teaspoons and tablespoons but have also included the metric equivalent. I am used to cooking out the spices a bit more at the start of a recipe, so I have slightly changed the order of cooking and added an extra stage. Because I was using tofu instead of salmon drained from a tin, I needed to make sure that this was cooked so I did that at the start of the cooking, too. The recipe states that it goes from the hob to the oven to the grill so be prepared to move it about a bit and keep those oven gloves handy. I think that Don (as I think I can now call him) spent more time reading scripts than refining his recipe, so he did not specify the type of cream (either for UK or US cooks). I have gone with double cream which I think the Americans call whipping cream. Many vegetarian substitutes are available, but I felt that this would benefit from an alternative, rather than a substitute, so I used tofu. It is sold in all major supermarkets, is easy to prepare and cook and is so versatile. 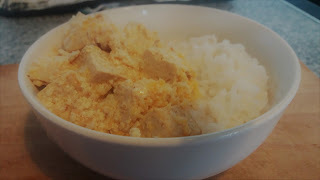 It is also an ingredient in many Thai curries and Donald’s is very similar to one of these, particularly with its inclusion of coconut. Finally, Mr Pleasence made no mention of temperature at any stage of the cooking process. If it were up to him it might just be a cold mush. I have gone with what seemed suitable and added it in below. 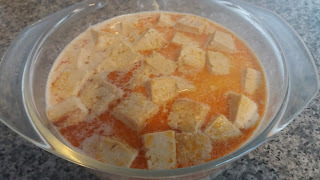 Rinse the tofu and dry with kitchen roll or a clean tea towel. 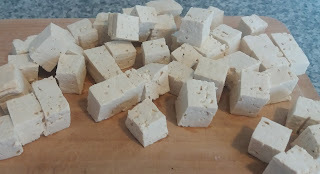 Cut into cubes. Melt the butter in a pan, over a medium heat on the stove. Add coriander, turmeric, chilli powder, ginger and garlic. Stir well until the spices are cooked. 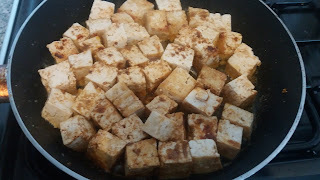 Then add the tofu and stir until coated with the spice mixture. Add the milk and cream, stirring until yellow. Transfer to a casserole dish with a lid. Cook in oven at Gas 7/ 220°C/ 425°F for another 15 minutes. 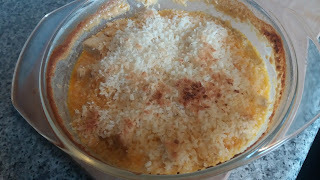 Just before serving, remove lid, sprinkle shredded coconut over and grill until lightly brown. Serve in bowls with rice. Donald said it served 4. I agree with Jenny that 2 is more like it. For Dave it was far too mild. 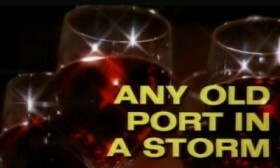 In fact, his words were (and I quote): “If it was the only port in a storm, I might consider heading for it.” But we do need to remember that this is the opinion of a man who likes his curry so hot that it makes him sweat (and, on occasions, cry). I enjoy more subtle flavours (and get ridiculed for being ‘Korma Girl’ when we go to an Indian restaurant with friends). I can't honestly say, though, that I really enjoyed this. For one thing, there was too much liquid. 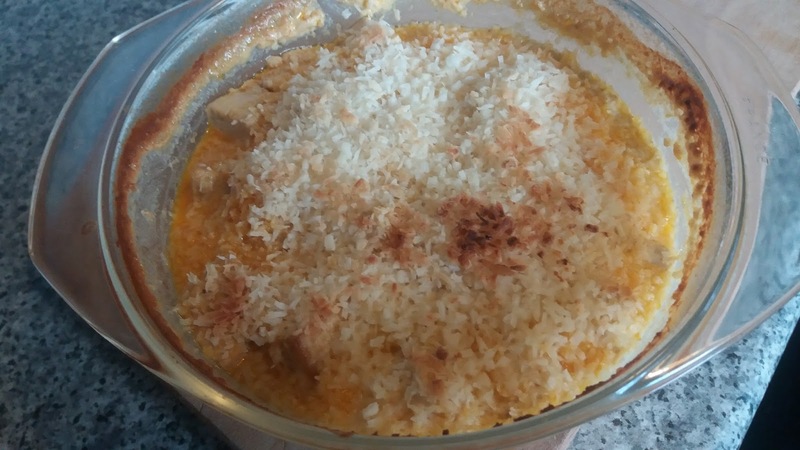 It is, though, a quick and easy recipe, which you could whip up when you fancy something tasty and simple, and you would have most of the ingredients in the cupboard. I might make this again with coconut milk and some lime, rather than the double cream and milk combination to make it more reminiscent of a lovely Thai-style curry. As has become the routine, we had this as a TV meal. All you need is a tray and a DVD player to enjoy eating the food while watching the episode.